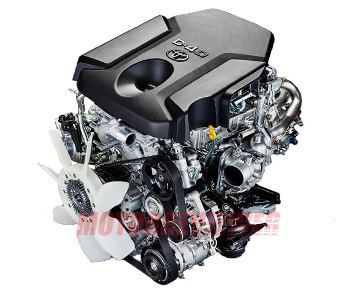 The new engine series named as GD came out in 2015 replacing the KD engine series - the most widespread 4-cylinder diesel engines produced by Toyota. The 1GD-FTV engine became a replacement for its predecessor - the 3.0L 1KD-FTV engine. The new 2.8-liter diesel first was used in Toyota LandCruiser Prado and later in other Toyota’s SUVs such as Toyota Fortuner and Toyota Hilux. The 1GD-FTV has a traditional cast iron cylinder block without liners. Like the 1KD, the new engine also equipped with two counter-rotating balance shafts. The balancing unit is located in a separate housing under the engine block and driven by a chain from the crankshaft. Some engine versions (for example, in Toyota Hilux) don’t have balancing unit for a cost reduction. The cylinder head is made from aluminum alloy. There are 4 valves per cylinder (two intake and two exhaust valves) or 16 valves total. The new head has better intake airflow and improved shape of combustion chambers. On top of the head, there are two chain-driven camshafts (intake and exhaust camshafts). The crankshaft doesn’t have a direct connection with camshafts. The 8.0 mm pitch timing chain is driven by a sprocket on a high-pressure fuel pump. The crankshaft drives the high-pressure pump by a single-row roller chain with pitch 9.525 mm. The valves are actuated by roller rocker arms equipped with hydraulic tappets. The GD engines are equipped with Common Rail direct fuel injection system. The pressure in the system is 35-220 MPa (5000-32000 psi). That impressive numbers are reached thanks to the HP5S type high-pressure pump. All components of the fuel system are made by Denso. The 1GD engines were equipped with variable nozzle turbines (VNT) also known as variable-geometry turbochargers (VGT) and air-to-air intercoolers. The intake manifold also has valves closing and opening one of two intake ports for each cylinder to improve the combustion process. The throttle body is electronically controlled; the throttle valve is driven by an electric motor. Depending on the market location and emission standard, the engine has a different amount systems for emission reduction. The full list includes the EGR, DOC, DPF, and SCR. The new engine in comparison with its predecessor (1KD) turned out to be 15% more fuel efficient and 25% more torque. According to Toyota estimates, the thermal efficiency of the new engine is 44%. The Toyota’s 2.8L diesel has a short report history yet. But many owners have already encountered some problems with the diesel particulate filter or DPF and high oil consumption from the first miles. After that, the new engine software upgrade was released to eliminate these problems. Only time will tell how it will affect reliability. The previous diesel series has already become obsolete in a number of parameters – fuel consumption, noise, power, emissions. The 1GD-FTV is a modern and technological advanced engine compared to the 1KD-FTV, but the performance specs are modest and all the advantages are smooth quiet operation and better emission standards.